We custom fit and build golf clubs to each customer’s individual specifications, to enhance and maximize each player’s performance and ability. Having a set built to the specific performance needs and swing characteristics of the golfer will allow the golfer the best opportunity to improve scoring and, more importantly, increase his/her enjoyment and love of the game. Hodson Golf provides fittings for all facets of your game: driver, iron, hybrid/fairway, wedge, putter, and ball fittings. Due to the complexities of each type of fitting, coupled with the individuality of each customer, fitting times vary for everyone. We currently charge $150 per fitting, with a portion going towards the purchase price of new equipment (portion applied depends on purchase amount and the overall length/time of the initial fitting). All fittings include a complimentary follow-up fitting once you have had a chance to break-in the new clubs. The follow-up fitting allows us to further fine tune your new equipment and/or make any improvements, if needed. When you contact us for a fitting, please let us know what type of fitting you are interested in (along with budget) so that we can allot enough time, and not have to rush things. 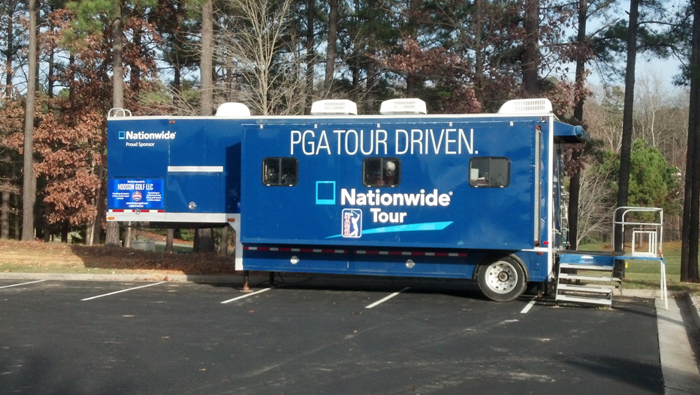 Hodson Golf also utilizes two authentic tour trailers, which allows us to bring our extensive PGA Tour repair expertise and experience to our most valuable customers. Hodson Golf is proud to be the region’s largest boutique shaft, grip, and head provider and have, at our disposal, many offerings typically found only on the PGA Tour Trailers. When it comes to professional/custom repairs, we can pretty much do it all (and we do it right the first time, unlike the hourly guys at the local big box). We are NOT the large corporate “big box” golf retailing chains that are only interested in selling as many mass-produced clubs as they can. 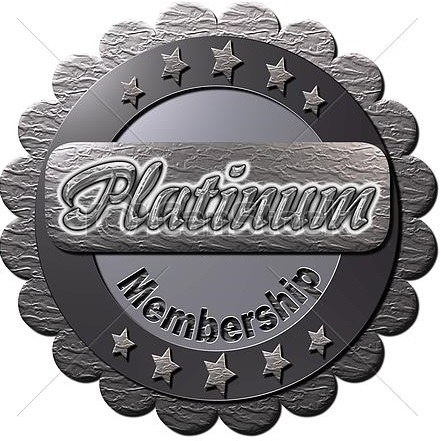 We are a small, locally owned, family run business with a core belief and focus on maximizing each individual customer’s player quality and satisfaction! In terms of equipment, our philosophy of ALWAYS CUSTOM, NEVER STANDARD is a stark contrast to that of our big box competitors. We are proud to offer the largest selection of premium driver shafts currently available. Our driver fitting system allows us to utilize all of our shafts in most driver heads currently available for even greater selection. (3) Premium shaft offerings including most high-end Japanese & prototypes (typically add $150-$1,000 to base driver range (1) above ($250-$300 is about average). Knowing beforehand your anticipated driver budget will help us to better narrow down the best shaft offerings for your individual swing profile within your budget range. We currently have over 100 individual driver shafts in our fitting system ranging from $0 upcharge to $1,000 upcharge. As always, a portion (if not all) of the launch monitor fitting fee will be included in the price of your new driver or reshaft. Also, knowing your budget and/or shaft interest, will help us to allocate enough time to your fitting as premium shaft fittings typically take more time for calibration and/or analysis. As one of the top 100 fitters as ranked by Golf Digest since 2010, Hodson Golf provides one of the most thorough fitting sessions available and utilizes one of the areas only Doppler Radar based Launch Monitors. This device can literally measure all facets/angles/trajectories of both the ball after impact but also the golfers swing while in motion. The following data points can then be determined during the golfers shot in order to more accurately fit the equipment, shaft, and ball type. The following services are now offered by Hodson Golf utilizing the Doppler Radar Launch Monitor. IRON LAUNCH MONITOR FITTING & BENDING PACKAGE TO DIAL IN ACCURATE DISTANCES BETWEEN ALL IRONS AND WEDGES. BALL FITTING IN ORDER TO DETERMINE THE BALL WITH THE HIGHEST VELOCITY, OPTIMUM SPIN, AND IDEAL CARRY AND ROLL FOR YOUR INDIVIDUAL SWING. Provides mobile repair services with PGA Tour repair experience. 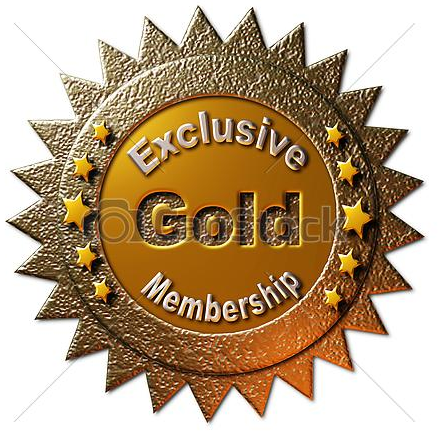 All aspects of custom and specialized club repair services available. Please check our current schedule for availability/scheduling or contact us for any questions you may have. Straight from the PGA Tour this official Tour Trailer saw nearly 6 years of action on Tour. There maybe other operations that claim to have a “Tour Trailer” but this one is about as real as it get’s with tour only equipment and accessories throughout. How cool is it to get professionally fit for custom equipment and then go into the rig and watch your clubs be built. This rig is also available for rent for any sized event (golf or otherwise). We are currently building this latest addition to our fleet which will debut early next year. 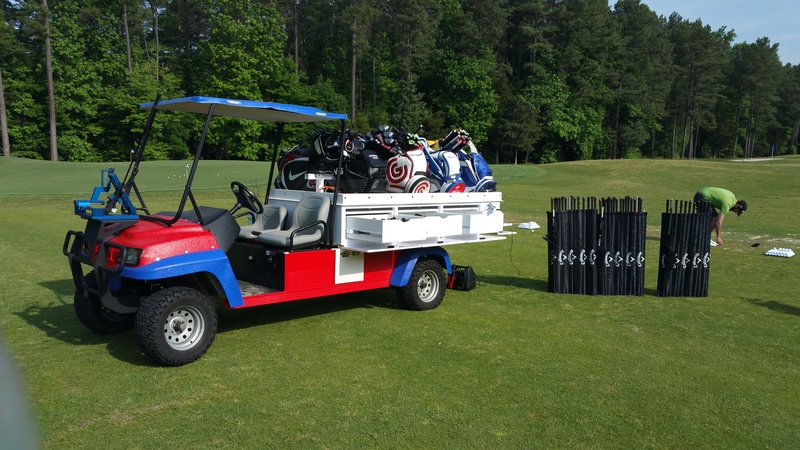 This custom made vehicle will be able to perform all fitting aspects directly on the driving range or on the course. Imagine having a fully stocked vehicle with all variations of manufacturers heads, shafts, grips which can be assembled (and bent if needed) directly where/when you are doing the fitting. Why be restrained to the driving range when you can hop on this vehicle and take the fitting to the course!